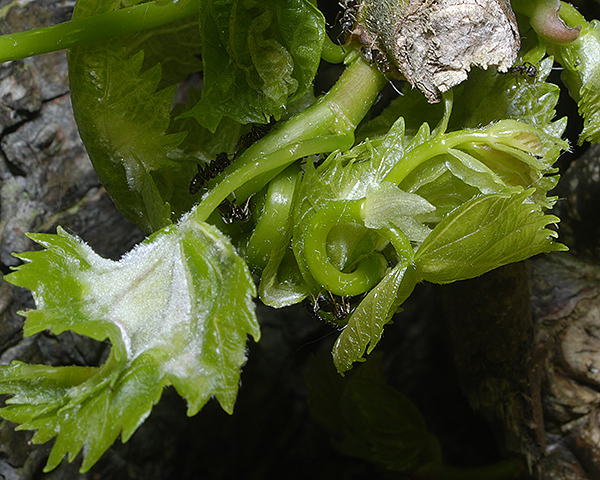 The Patchiella reaumuri fundatrix lives in a compact leaf-nest pseudogall (see first picture below) formed by twisting and stunting the epicormic shoots of Tilia species (lime). The fundatrix (see second picture below) is very dark green or brown, plump-bodied with a body length of about 3.5 mm. The Patchiella reaumuri fundatrix has no siphunculi. The immatures, which initially cluster on and around the fundatrix, are green. As they mature, they develop wax tufts along the sides of the abdomen, and all develop to alatae (see third picture below). The alate Patchiella reaumuri has numerous hairs on its antennae, and 0-3 secondary rhinaria on the fifth antennal segment. The body length of the alate is 2.1-2.7 mm. The apterae on the secondary host (not pictured) live on the rhizomes of Arum. They are whitish with a powder wax coating. 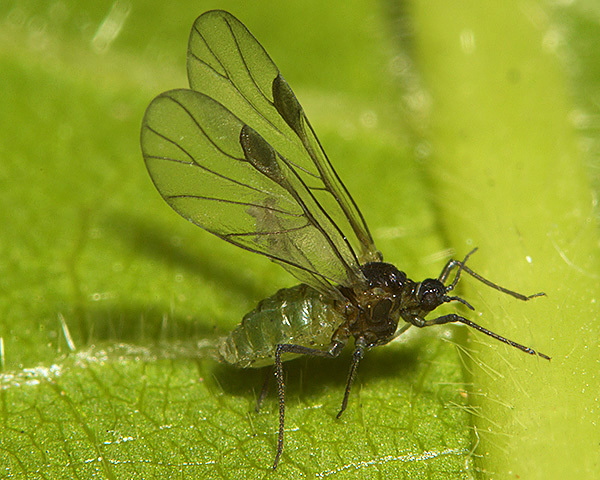 The lime leaf-nest aphid host alternates between its winter host lime (Tilia), where it forms a leaf nest, to its summer host - which, in Europe, is mainly cuckoo-pint (Arum maculatum). Males and females occur in autumn and eggs are laid on lime in autumn. Patchiella reaumuri has an apparently rather patchy distribution in Europe, including Britain, but is probably under-recorded in some countries. Populations in some countries (Hawaii, Solomon Islands) have lost their primary host, and reproduce parthenogenetically all year on the roots of Araceae. In those countries Patchiella reaumuri is called the taro root aphid. Dixon (1971) describes how Patchiella reaumuri forms dense aggregations inside leaf pseudogalls in spring. 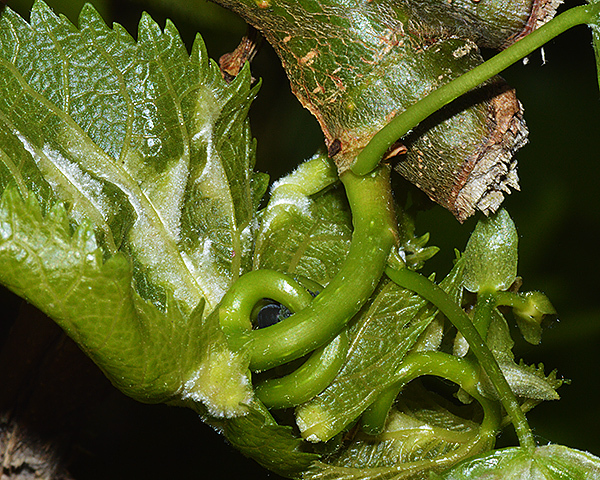 The picture below shows the extreme twisting of the epicormic shoots that creates the leaf nest. Another feature we have noted of the galls is that many of the leaves have a white erineum on one side. It is unclear whether this is a direct response to feeding by Patchiella or a concurrent infestation with another agent. 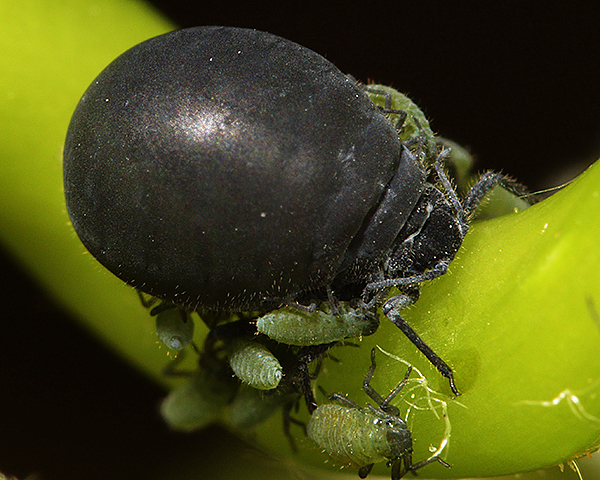 The lime leaves are often folded tent-like to enclose the aphid colony on the twisted shoots as shown in the picture below. 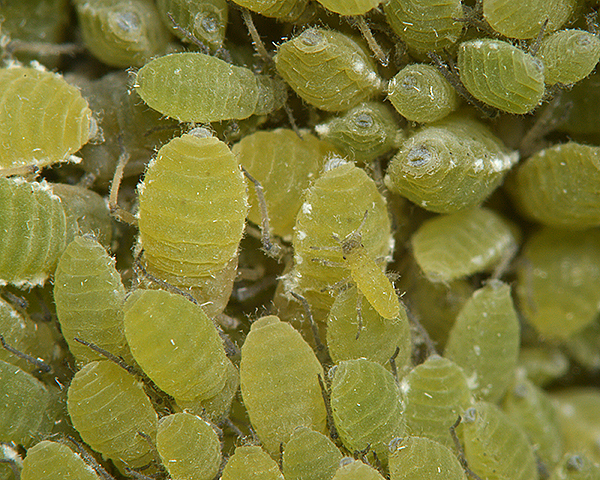 The Patchiella reaumuri fundatrix can produce a very large number of offspring, which develop protected within the leaf nest. 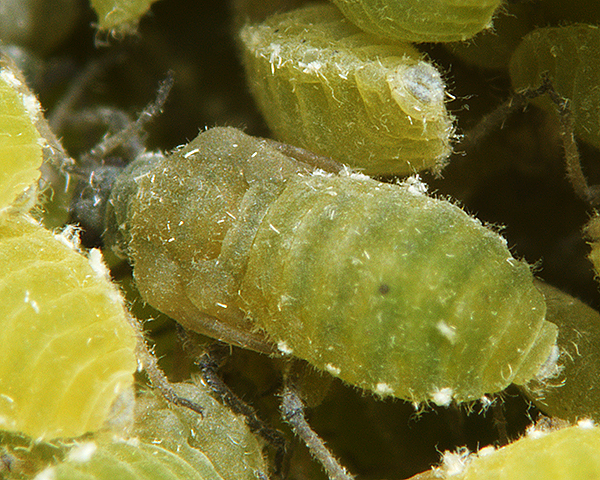 Immature Patchiella reaumuri often have tufts of wax along their sides (see pictures below). All the offspring develop to alatae. The pictures below show third instar and fourth instar future alatae. The alate (see picture below) is a slightly darker green and has faint dark cross bands on the abdominal segments. 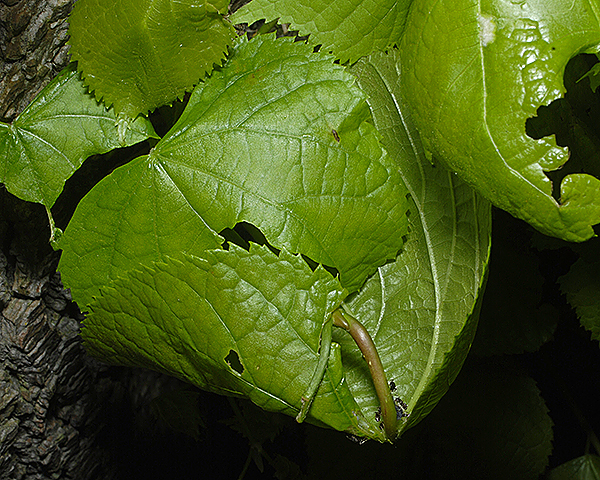 The mature alatae leave the lime in late May and June and colonise the roots of Arum maculatum. The only information regarding Patchiella reaumuri on its secondary host in Europe can be found in Stroyan (1979). It returns to lime in the autumn when the lime leaves are senescing. The fundatrix is usually closely attended by ants and is antennated vigorously. The only ant species we have so far found attending Patchiella reaumuri is the black garden ant (Lasius niger). 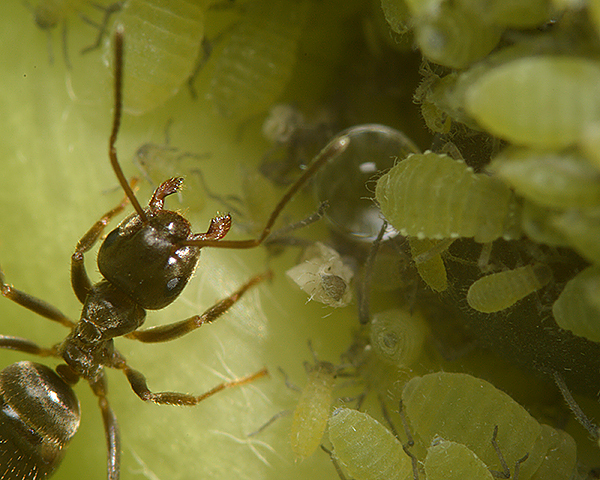 At first the ants only seem interested in the fundatrix, perhaps because she is able to produce far more honeydew than the immatures. This is in contrast to species such as Symydobius oblongus, attended by Formica rufa, where the immature aphids seem to be of more interest to the ant than the adult (see Symydobius oblongus). 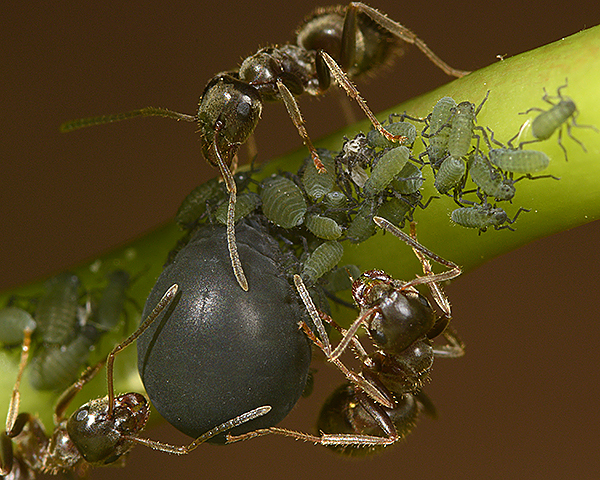 Later in the life time of the colony, the ants switch their attention to the developing immatures. 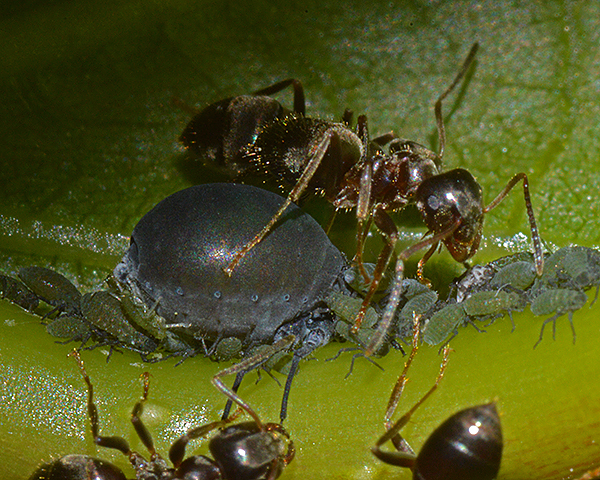 The ants both defend these aphids from predators, and consume the copius honeydew which would otherwise befoul the colony. Patchiella reaumuri have been recorded from 5 Tilia species (Tilia amurensis, Tilia x europaea,. 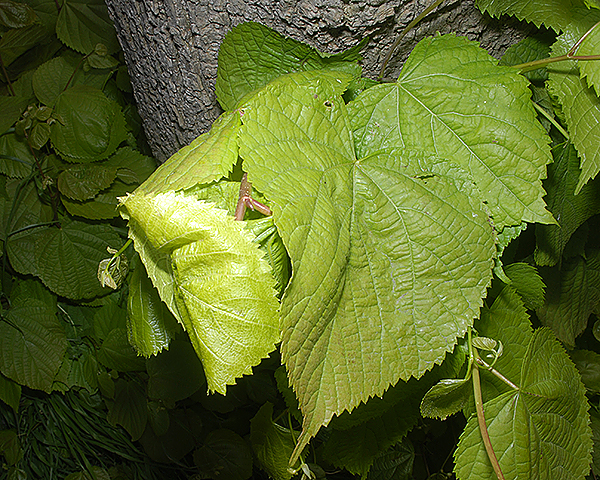 Tilia platyphyllos, Tilia tomentosa). Blackman & Eastop list only 3 species of aphid as feeding on common lime (Tilia x europaea) worldwide, and provide formal identification keys. Baker (2015) lists all 3 aphid species as occurring in Britain: Aphis fabae, Eucallipterus tiliae and Patchiella reaumuri. Patchiella reaumuri have been recorded from 4 Arum species (Arum besserianum, Arum italicum, Arum maculatum, Arum orientale) - plus Colocasia esculenta and possibly Arisaema trifoliatum. Blackman & Eastop list 3 species of aphid as feeding on cuckoo-pint (Arum maculatum) worldwide, and provide formal identification keys. 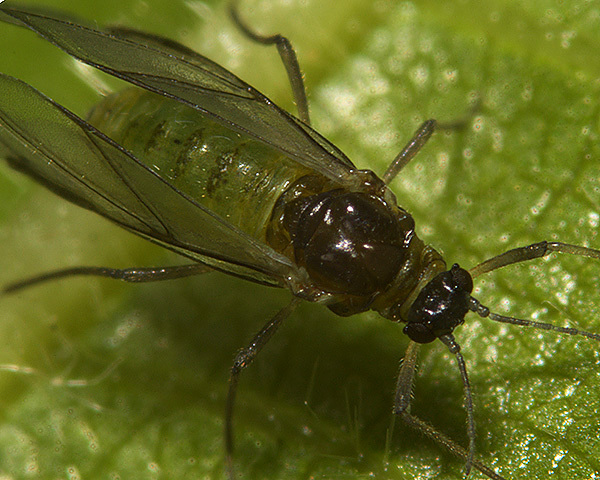 Of those aphid species Baker (2015) lists only one as occurring in Britain: Patchiella reaumuri. Whilst Patchiella reaumuri is generally not considered a pest on its primary host (Tilia), it is one of the most destructive insect pests on one of its secondary hosts - dryland taro (Colocasia esculenta) (Sato, 2000). Evidence of infestation appears as a white waxy deposit on the fibrous roots. 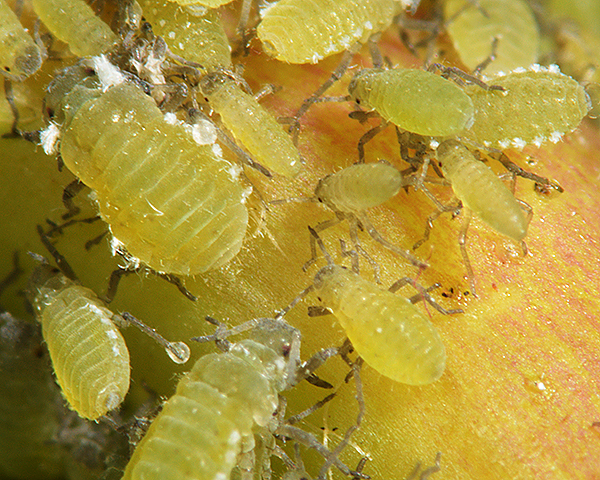 When populations are high, yellow-green aphid colonies can be found on both the roots and the basal portions of the leaf sheaths. 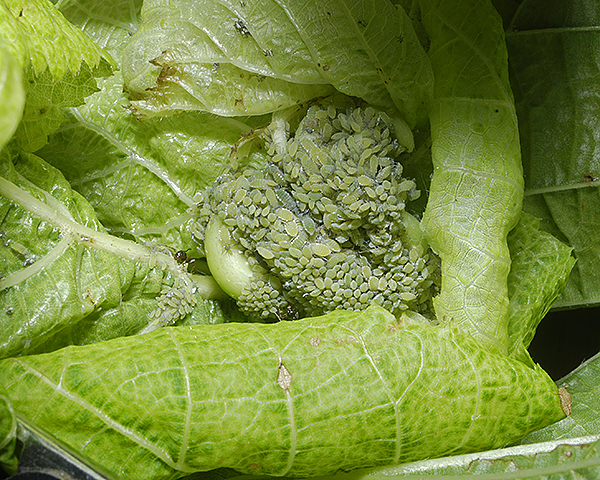 If the infestation is confined to a small area, the crops should be removed and destroyed. The ground should then be deep cultivated to drive away the ants. Stroyan, H.L.G. (1979). 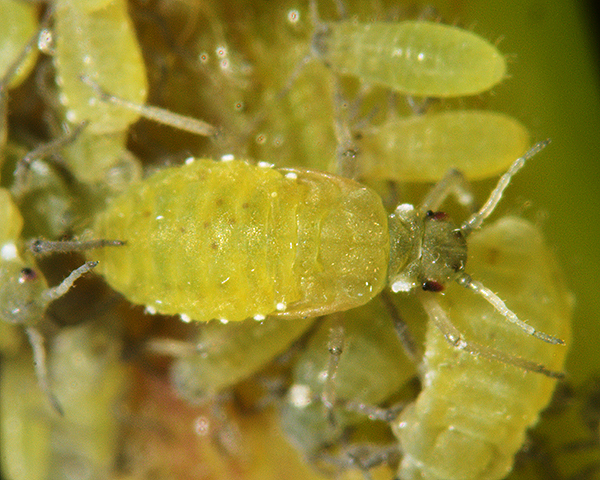 An account of the alienicolous morphs of the aphid Patchiella reaumuri. Zoological Journal of the Linnean Society 67, 259-267.